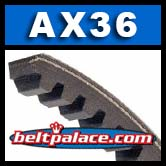 AX36 Industrial Grade Bando V-BELT. AX36 Industrial Grade Bando V-BELT. 1/2" TW x 38 in o.c. 4L380 FHP V-Belt. 1/2” W x 38" Length. Replaces Classical A36 V Belt on light duty applications.